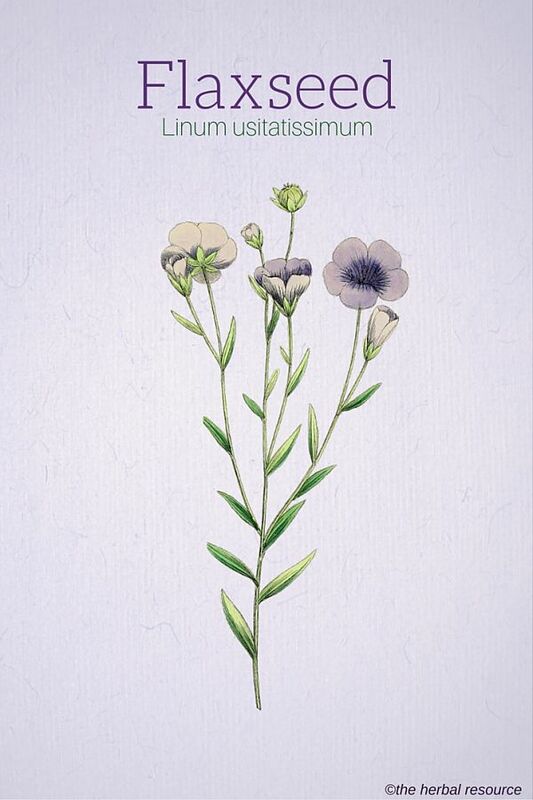 Other Common Names: Linseed, chih-ma, common flax, flax, flax weed, lint bells, toad flax, uma, winterlien. 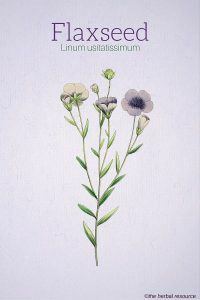 Habitat: Flax is thought to have originated in Egypt and was found from the Mediterranean to India. However, it is one of the oldest cultivated plants known and has been found during the excavation of ancient Egyptian tombs. Today, it is cultivated around most of the world since it is not only valued for its nutritional and medicinal uses, but it is also used in the making of cloth, paper, and other useful products. Flax prefers deep, moist soils that are rich in sand, silt, and clay. Description: The plant is a small herbaceous annual with a single stem that reaches a maximum of 4 feet in height. The stalk has alternating rows of linear, inch-long leaves. Flax blossoms have five petals and are usually blue, but can also be bright red. 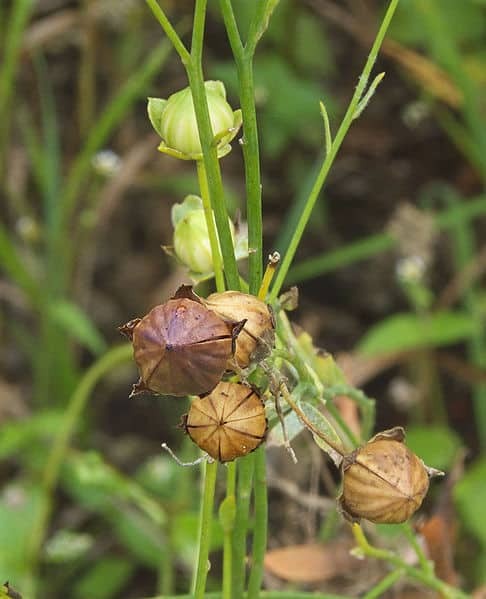 After the flowers have died, flax bears a fruit that is a round dry capsule less than a centimeter in diameter. Each capsule contains several seeds that resemble small apple seeds. Plant Parts Used: The seeds are used whole or crushed. Flaxseed oil is extracted by pressing the seeds. Only cold-pressed oil is used as food and herbal medicine. The seeds, which are high in fiber and mucilage, absorb large amounts of fluid and draw out toxins when ingested and act as a gentle bulking laxative. Flaxseed is, therefore, both an effective herbal treatment for diarrhea and constipation. In addition, the herb may maintain a healthy digestive tract and even be effective in the prevention of chronic diseases such as diverticulosis and ulcerative colitis. Flaxseed oil is well-known for its high content of essential fatty acids. These fatty acids are only accessible if the seeds are split prior to ingestion. Essential fatty acids such as linolenic acid and linoleic acid have numerous health benefits including the prevention of heart disease and healthy fetal development. Flaxseed may be a natural remedy for high blood pressure and may also lower levels of a protein called homocysteine in the blood. This protein is measured as a major risk factor for the onset of heart disease. These small seeds are also a rich source of fiber known as lignin. Friendly bacteria that are naturally occurring in the digestive tract convert lignans into compounds that may fight cancer by reducing tumor size. Lignan fibers also mimic estrogen in the body and may modulate hormone levels, thereby providing a natural remedy for hormone fluctuations associated with menopause and premenstrual syndrome. The anti-inflammatory compounds in flaxseed may provide an herbal treatment for relief of symptoms associated with rheumatoid arthritis, psoriasis and other inflammatory diseases. Sjögren’s syndrome patients may find relief of dry eyes with the treatment of ingested flaxseed oil. A single trial has provided evidence that the fatty acids found in seed oil may naturally improve symptoms associated with attention deficit hyperactivity disorder (ADHD). 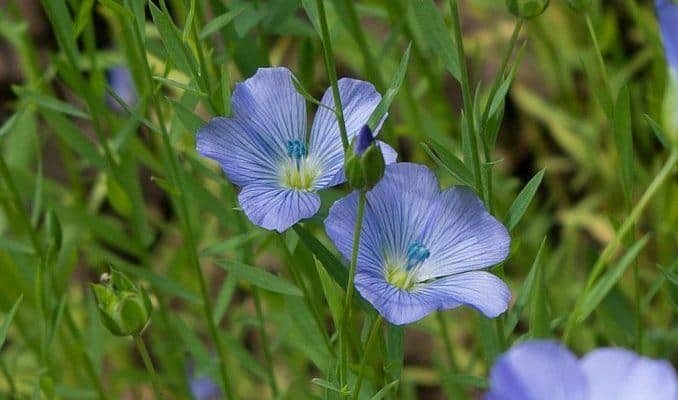 Flax is used traditionally as an herbal, topical treatment for chronic coughs, bronchitis, pleurisy, emphysema and boils. 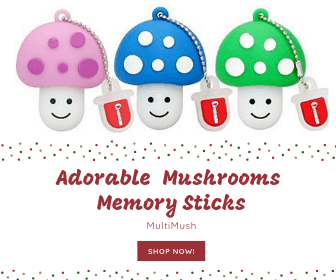 The seeds also have antioxidant properties, which may be the basis for a recent claim by bodybuilders that it decreases recovery time after injury and increases stamina. Flaxseeds should always be taken with lots of water because they absorb water from the body during digestion. Seeds can be soaked in water prior to consumption. The maximum dosage is 50g of seed or 20g of oil daily. The recommended dosage for adults and children over 12 years old is 5 to 10g of seeds – whole or crushed, or 1 or 2 tablespoonfuls or 1 or 2 capsules of flaxseed oil daily. Children 6-12 years of age can receive half the adult dose, though 1 teaspoon of oil should be sufficient to relieve constipation. It is only recommended to give the seed to children under 6 years of age with strict medical supervision. The administration should be for two to three days at a time. The oil should be used within 24 hours of grinding otherwise the ingredients lose their properties. Flax may change the effectiveness of some medications including blood thinning medications such as aspirin or warfarin, diabetic medications such as insulin, oral contraceptives or hormone replacement therapy. If taking any of these medications, a healthcare professional should be consulted prior to use. Once confirmed safe, it is suggested that the seeds be taken several hours before or after taking other medications or supplements since it may slow the absorption of these other oral medications. One study has suggested diets rich in some of the fatty acids found in flaxseed may be linked to increased risk of macular degeneration. People with diabetes, prostate problems, or schizophrenia should consult their doctors before taking this herb. Skenderi, Gazmend: Herbal Vade Mecum: 800 Herbs, Spices, Essential Oils, Lipids Etc. Constituents, Properities, Uses, and Caution. Rutherford, New Jersey, Herbacy Press 2003. Integrative Medicine Communications: Quick Access: Consumer Guide to Conditions, Herbs & Supplements. Newton, Integrative Medicine Communications 2000. Blumenthal, Mark (senior editor): The ABC Clinical Guide to Herbs. Austin, Texas. American Botanical Council 2003. Borchorst, Georg: Urter og urtemedisin. København (Copenhagen), Denmark. Klitrose 1991.